Brandywine Asset Management commentary for the month ended June 30, 2018. Strong performance from Brandywine Asset Management's short-term momentum and long-term directional arbitrage strategies combined with Brandywine’s Adaptive Risk Management system to produce record profits in June. Although Brandywine has more than 35 years of investment experience, our research process is never complete. We strongly believe in continuing to research and employ additional investment strategies, portfolio allocation models and risk management techniques that have the potential of enhancing our investors’ returns. It was that philosophy that contributed to the record profits produced in June. 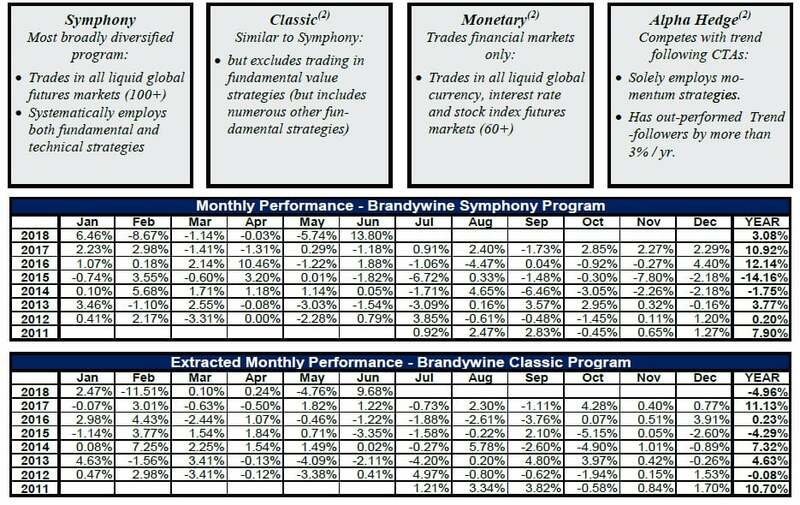 Since the inception of Brandywine’s Symphony program in 2011, Brandywine has employed a risk management approach based on creating balance among markets and strategies within the program. This approach, originally developed for and used in Brandywine’s highly successful Benchmark program during the 1990s, focuses on “predictability” - producing performance in the future that is most likely to be similar to a program’s past performance. (It is important to state however that PAST PERFORMANCE CAN NEVER BE COMPLETELY PREDICTIVE OF FUTURE PERFORMANCE.) While this goal may seem obvious, it is actually quite different from the goal sought by many of the more popular academic approaches used by other investment managers. Those “mean-variance” approaches attempt to create “optimal” portfolios that maximize risk-adjusted returns. While this in itself also sounds like a laudable goal, in reality it is meaningless to achieve that optimization on back-tested data if it fails to be replicated in the future. This is what led Brandywine to focus 30 years ago on predictability first and foremost. We have revisited Brandywine’s risk management approach in this report because as a result of our ongoing research, Brandywine incorporates some portfolio allocation processes that assisted in producing June’s record performance. Rather than employing a static target risk level each day, Brandywine uses an Adaptive Risk Management approach that - intra-month - takes advantage of a portion of accumulated profits to allow for an increase in risk exposure. While this does not impact most negative months, it does on occasion allow for outsized profits to be achieved in some positive months. The downside (there is always a tradeoff), is that some positive months may be less positive than they would have been absent the use of Adaptive Risk Management (as the approach may ratchet up exposure that results in losses). All-in all however, the use of Adaptive Risk Management should result in a more positive skew to Brandywine’s performance. June was a recent example of the benefit of this approach. We believe this approach has the potential to provide Brandywine with similar opportunities a few times per year. As always, please feel free to contact us with any questions or comments you may have. extracted from the actual performance of trades executed within the Brandywine Symphony Program. Programs (split equally between Symphony and Classic) and 1/3 each to Monetary and Alpha Hedge, reallocating monthly. extremely high risk relative to the potential and actual losses relative to the actual cash invested.